Wat Suthat is one of the largest and oldest temples in the city of Bangkok. The holy shrine was built during the 19th century. The temple features a large red frame of a giant swing which was once used during annual ceremonies to celebrate and thank Lord Shiva. The wall murals and the main hall are also impressive. The temple is very peaceful and will sure put you in a blissful mood on a visit. Stay away from over friendly people; they may be cheats in disguise. 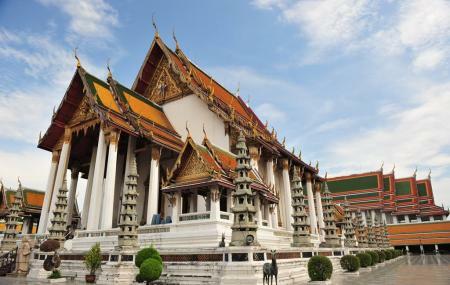 How popular is Wat Suthat? People normally club together Bangkok Wat Arun and Ananta Samakhom Throne Hall while planning their visit to Wat Suthat. People also prefer to end their day with Wat Suthat.